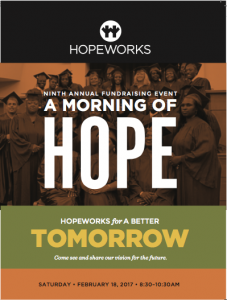 Each year friends and supporters of HopeWorks come together for a “Morning of Hope.” For the past 8 years, this breakfast gathering has highlighted the key events that occurred during the year in terms of workforce development, adult education, and spiritual growth. During that time, our keynote speakers have been motivating and encouraging. These included Dr. Harold and Sally Shank, Sean Tuohy, Bill Strickland, Dr. Ruby Payne, Bill Courtney, Dr. Ben Carson, Lucille O’Neal and Gregory Boyle. Each provided us with inspiring stories that connected their life with the mission and dreams of HopeWorks. This year will be no exception in terms of quality speakers. B. Chris Simpson, Eric Gentry, and Bob Turner have the advantage of their closeness and regular “hands on” interaction with our students and our programs. The common theme that they possess is an active role on our board of directors and an ability to communicate clearly and passionately the key components of the mission of HopeWorks. Please make your plans to attend. The breakfast will be held on Saturday, February 18, 2017 from 8:30-10:30am. The new location for the breakfast is the Esplanade Banquet and Conference Center, 901 Cordova Station, Cordova, TN 38018. 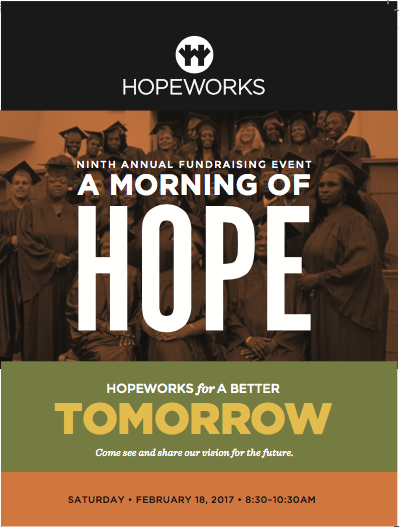 It will serve as a wonderful location to hear about the current and exciting future work of HopeWorks, as we move into a new location that is designed to serve more men and women. Order tickets here online through Eventbrite or call 901-272-3700 x104.